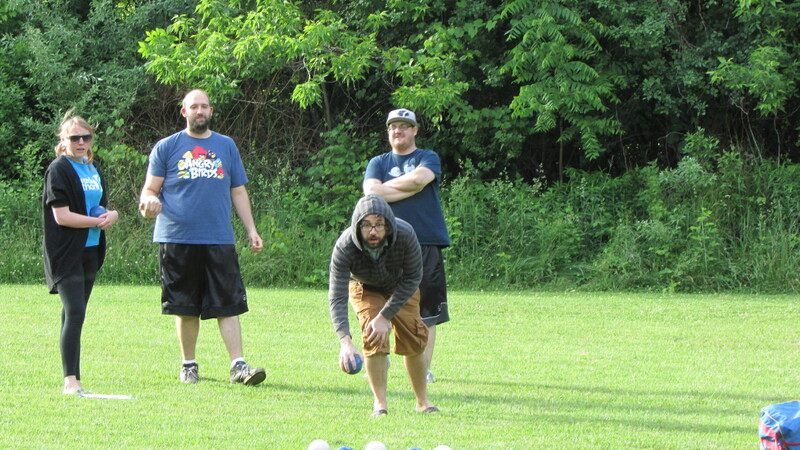 The bocce this week was more awesome than if Willie Wanka changed his chocolate factory over to a beer factory. It was a little cooler than normal, but that pact with Satan I made held out and we had yet another rain free, mostly sunny, 70ish degree day. Lets get to the bocce! Some Innuendo squared off against 2015 elite eight team Bocce Against the Machine, and had a great showing winning by all three games. Some Innuendo has started the year off hot as can be with an 8-1 record. Keith Curreri had 19 points to lead the way for Some Innuendo, and might have scored 20 if his partner had not knocked out his game winning shot and replaced it with her own. Still, I don’t think anybody can be too upset about winning 3 games against a very good team. Amerika’z Most Wanted played a great game against Schaffer BMW. It was a close series with Amerika’z Most Wanted winning the first game 12-6, Schaffer BMW winning the second game 11-9, and Amerika’z Most wanted taking the third game in overtime with a 12-10 score. For the series it was a 2-1 split with two of the three games being won by the two point minimum. 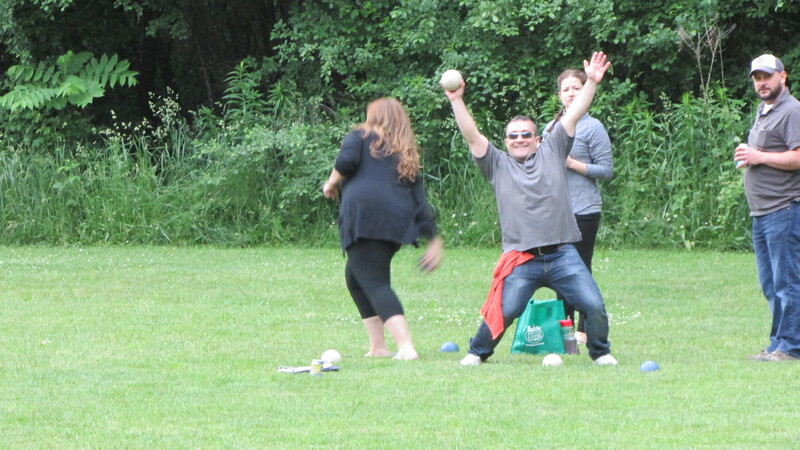 Not only was it close, it was a well played series with 9 aces scored between both teams, and plenty of bocces like the one you can see below. Amerika’z Most wanted is now 8-1 and seems to have recaptured their championship form. Andy Ingalls lead the way in points with 18, but Anson Zeppetello’s season high 5 Aces definitely helped. 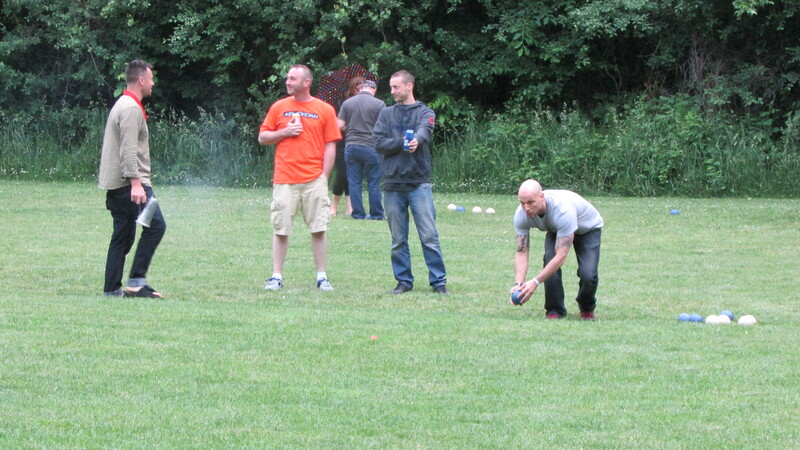 Week 3’s longest game was played between the Alcoballics and Rob & Jon. This series was also a 2-1 split with Rob & Jon wining a really tightly fought first game 11-8, and the Alcoballics coming back to win the second game 11-3. As you can see below, the third game stretched into the night, with Rob & Jon gaining momentum back and winning 11-3. Fun fact, all four players in this game scored between eleven and thirteen points – that’s parity. Check below to read Emily Cummings feelings about Turbo Bocce. One of the better games of the day was the match up between Eazy Duz It and Big LaBocce. Two great bocce teams squaring off with the series ending in a 2-1 split. In game one, Big LaBocce continued their winning ways and Eazy Duz It continued their losing ways, with an 11-8 Big LaBocce victory. But a team as good as Eazy Duz It is not going to lose for long and they broke out of their mini-slump with two huge 13-5 and 11-4 wins, taking their first series of thee year and making their mark on this season. Bill LaBrake lead the way with 19 points. Lets play a game I’m going to call Bocce Family Feud! Can’t you just picture the theme music in your head? I can’t. I don’t remember the Family Feud music so instead I’m humming the Price is Right music to myself. It seems to work. 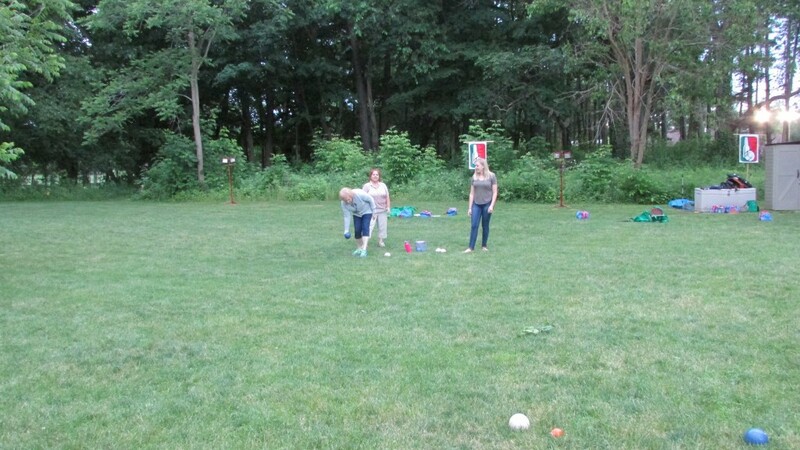 Here’s how Bocce Family Feud works. 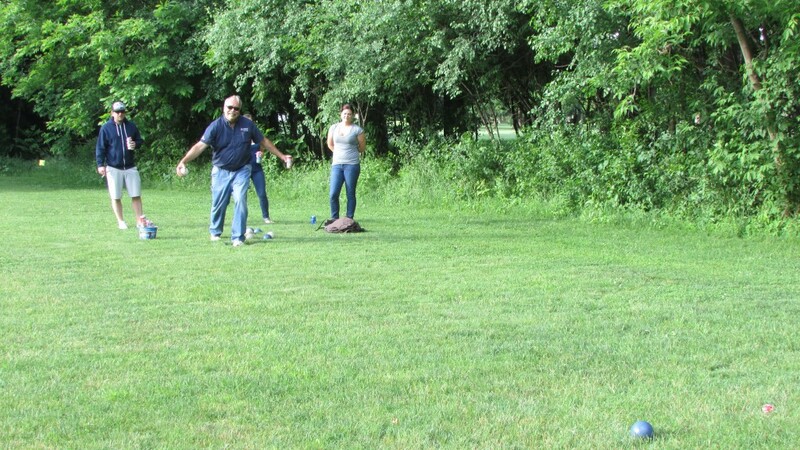 Two family members play against each other in bocce and I tell you about it. Its not participatory, so just shut up and listen. If you don’t like it, I suppose you can try to guess some answers. Hint, every answer is Pimp Suit. 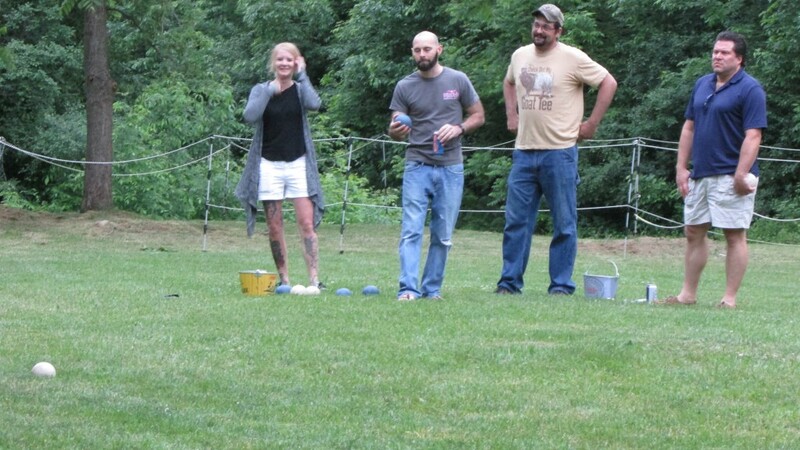 In the first Bocce Family Feud Game, The Dog Brothers (who you may remember as the original Black Jesus or Vince’s Gourmet Imports) finally got their first game of the season in against Twinning. This match up pitted George Christou of The Dog Brothers against his wife Siobhan Christou of Twinning. Siobhan, by the way, has been killing it this year, and is among the league leaders in points. You might think The Dog Brothers would show rust not having played the first two weeks, but that was not the case, they won the first game 12-5 with George scoring 7 points and Siobhan scoring just 2. Check the video below if you want to see how well George was playing. 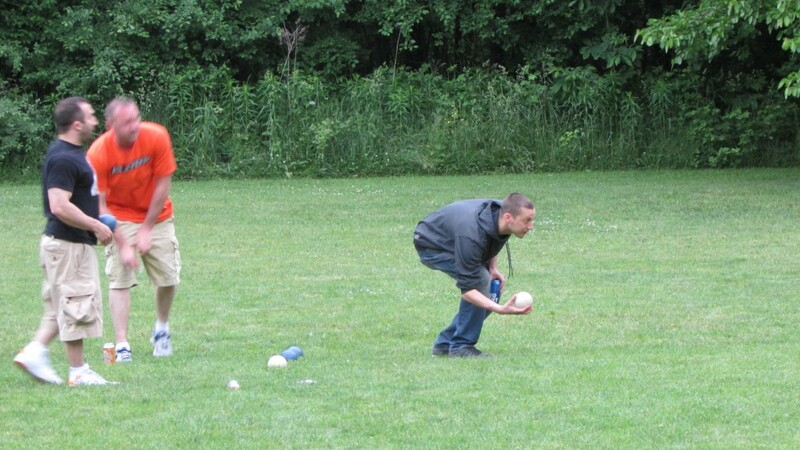 The second game was slightly better for Twinning, but not by nearly enough – The Dog Brothers won 11-6. In the third game, both Twinning and Siobhan seemed to recapture their true form. Siobhan scored 7 points and Twinning won the game 11-6. In the second Bocce Family Feud Game, A.J. Dougherty of 2 ½ Kittens needed a substitute for his partner Steve Henry, and he chose Kevin Lamson whose daughters just so happen to play for the opposing team, Mean Girls. To add a little more drama to the family showdown, this game also happened to be the Bounty game. 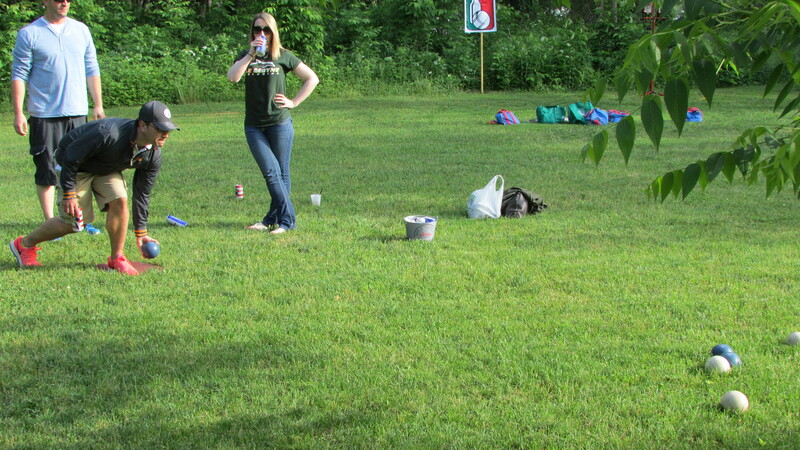 2 ½ Kittens won the first game big, 11-2, but Mean Girls came back and won the second 12-8. The series, the bounty, and the family feud would all come down to the third game, which was close, but which 2 ½ Kittens ended up winning 11-8. Ironically, the big hero in this family feud was the one person who was not related to the other three – A.J. Dougherty scored 20 points despite Heather Cleveland making shots like the one below. We didn’t have many 20 point scorers, but we had a lot who scored 19. Here is the honorable mention list: Keith Curreri, Bill LaBrake, Greg Griffo, Josh Wheeler, and Justin McLaughlin. Julie Gilbert, Jeff McGann, Starr Landers, Anson Zeppetello, Josh Wheeler, Sean Flynn, and Johanna Russell had 2. If you don’t see your stats, you can check the stats for every team and player in the league HERE. 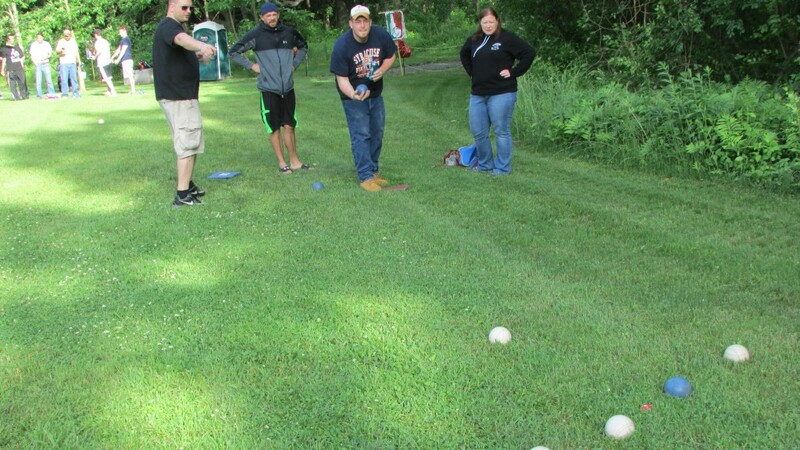 This year we are going to try to interview a different player each week to give you a perspective on playing bocce that’s not mine. I figure that can only be a good thing. This week its Emily Cummings from Alcoballics. 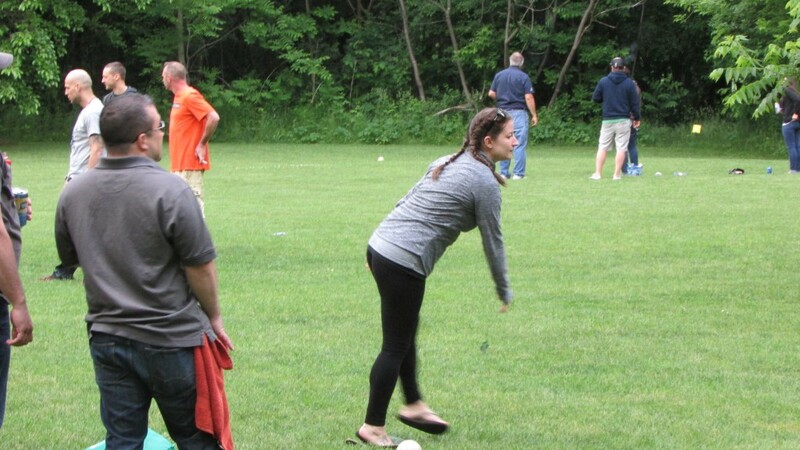 Turbo Bocce: How many years have you plaed Turbo Bocce. 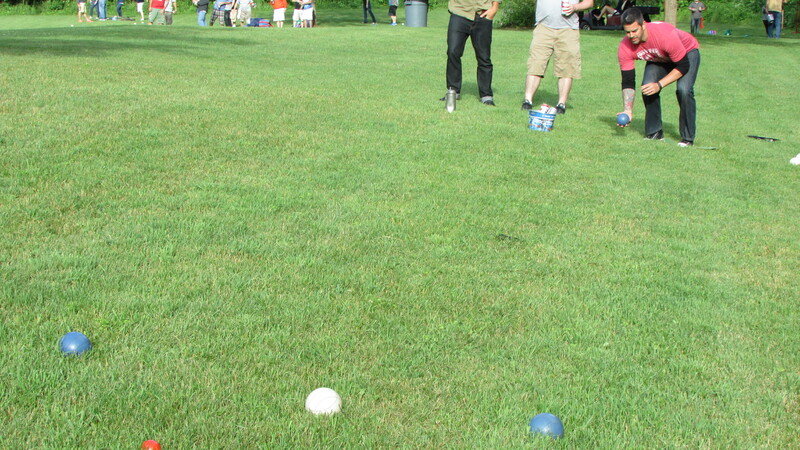 Turbo Bocce: Do you have any bocce tips you want to share with the rest of us? Turbo Bocce: What’s your favorite bar in Syracuse? 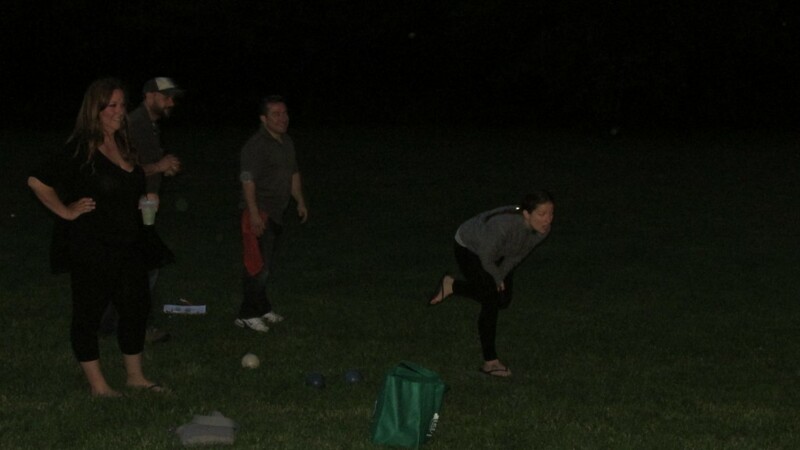 Turbo Bocce: Who would you let punch you directly in the face? Turbo Bocce: How many times does it take for you to listen to a song that you love before you actually hate it instead? Now you know the story. I personally am impressed that Emily knows exactly what she hates. She doesn’t start to hate a song after “a few months” or after listening to it “a lot” she hates a song after listening to it exactly 62 times. My suggestion is that you not say anything to Emily 62 times, although unless your name is Jim Whipple and the subject is you being Turbo Bocce champion you probably don’t have to worry about reaching that number. This week’s “bit of advice to hold you over until bocce” comes straight from Netflix suggestions. Also, strangely, murdering puppies. What’s wrong with you? 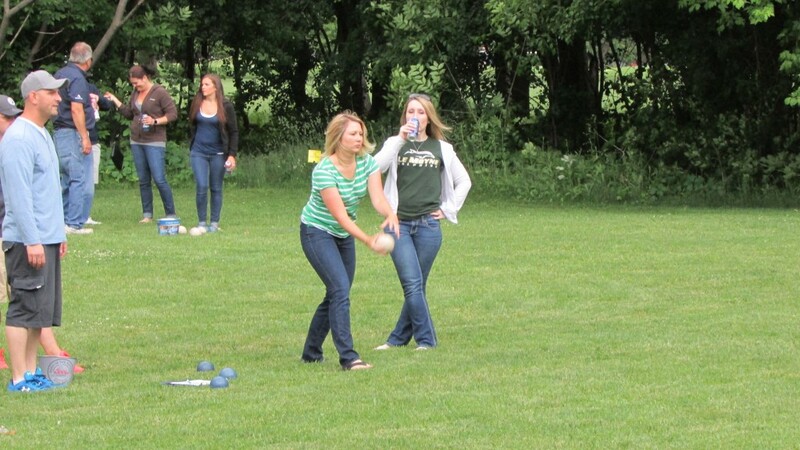 As always, if you want to see more bocce pics you can find them on Facebook HERE.